2017 was a year for slow, procedural breakthroughs. Here is an update on the lawsuits that EFF and other organizations have against broad NSA surveillance powers. EFF began 2017 with significant leverage in our signature lawsuit against NSA surveillance, Jewel v. NSA. The year prior, U.S. District Court Judge Jeffrey White in Oakland, California, ordered the U.S. government to comply with EFF’s “discovery” requests—which are inquiries for evidence when lawsuits advance towards trial. In several lawsuits, this process can take months. In Jewel v. NSA, simply allowing the process to begin took eight years. This year, EFF waited expectantly for the U.S. government to provide materials that could prove our plaintiff was subject to NSA surveillance through the agency’s practice of tapping into the Internet’s backbone to collect traffic. But expectations were tempered. The U.S. government’s lawyers missed the discovery deadline, asked for an extension, and were given a new, tentative deadline by the judge: August 9, 2017. The U.S. government’s lawyers missed that deadline, and asked for an extension, approved by the judge: October 9, 2017. The U.S. government’s lawyers missed that deadline, and asked for another extension, this time indefinitely. Producing the materials, the government attorneys claimed, was simply too difficult to do on a timely basis. “[T]he volume of documents and electronic data that the government defendants must review for potentially responsive information is massive,” the attorneys wrote. EFF strongly opposed the government’s request for an indefinite extension, and suggested a new deadline in January to comply with the court’s previous orders. The judge agreed and put an end to the delay. The deadline is now January 22, 2018. The basic premise of our questions is simple: we want information that explains whether the plaintiffs’ data was collected. EFF hopes the government can follow the judge’s orders this time. EFF filed an amicus brief this year asking the Supreme Court to overturn a lower court’s ruling that allowed government agents to bypass the Fourth Amendment when searching through the electronic communications of U.S. persons. The amicus was filed after a decision in Mohamud v. United States, a lawsuit that concerns the electronic communications of American citizen Mohamed Mohamud. In 2010, Mohamud was arrested for allegedly plotting to use a car bomb during a Christmas tree lighting ceremony in his home state of Oregon. It was only after Mohamud’s conviction in U.S. v. Mohamud that he learned the government relied on evidence collected under Section 702 of the FISA Amendments Act for his prosecution. Section 702 authorizes surveillance on non-U.S. persons not living in the United States. Mohamud fits neither of those categories. After learning that the evidence gathered against him was collected under Section 702, Mohamud challenged the use of this evidence, claiming that Section 702 was unconstitutional. The U.S. Court of Appeals for the Ninth Circuit, which heard Mohamud’s counter arguments, disagreed. In a disappointing opinion that scuttles constitutional rights, the court ruled that Americans whose communications are incidentally collected under Section 702 have no Fourth Amendment rights when those communications are searched and read by government agents. Together with Center for Democracy & Technology and New America’s Open Technology Institute, EFF supported Mohamud’s request that the U.S. Supreme Court reconsider the appellate court’s opinion. EFF also filed an amicus brief in the case of U.S. v. Agron Hasbajrami, a lawsuit with striking similarities to U.S. v. Mohamud. In 2011, Agron Hasbajrami was arrested at JFK Airport before a flight to Pakistan for allegedly providing material support to terrorists. In 2013, Hasbajrami pleaded guilty to the charges. Hasbajrami’s court case was set for July 2015. Before going to trial, Hasbajrami pleaded guilty a second time. But then something familiar happened. Much like Mohamud, Hasbajrami learned that the evidence used to charge him was collected under Section 702. And, just like Mohamud, Hasbajrami is a U.S. person living inside the United States. He is a resident of Brooklyn, New York. Hasbajrami was allowed to request to withdraw his plea, and his lawyers argued to remove the evidence against him from court. Hasbajrami’s judge denied the request, and the case was moved to the Second Circuit Court of Appeals. EFF and ACLU together urged the Second Circuit Court of Appeals to make the right decision. There is opportunity for the appellate court to protect the constitutional rights of all Americans, defending their privacy and enshrining their security from warrantless search. We plead to the court to not make the same misguided decision made in Mohamud v. U.S. The Wikimedia Foundation scored an enormous victory this year when an appeals court allowed the nonprofit’s challenge to NSA surveillance to move forward, reversing an earlier decision that threw the lawsuit out. 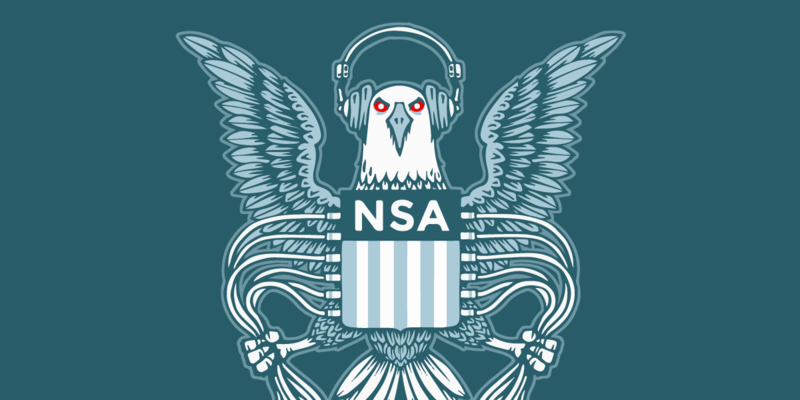 Represented by the ACLU, Wikimedia sued the NSA in 2015 for the use of its “upstream” program, the same program that EFF is suing the NSA over in Jewel v. NSA. Wikimedia argued that the program infringed both the First Amendment and Fourth Amendment. Originally filed in the U.S. District Court for the District of Maryland, Wikimedia’s lawsuit was thrown out because the court ruled that Wikimedia could not prove it had suffered harm due to NSA surveillance. This ability to prove that a plaintiff was actually wronged by what they allege is called “standing,” and the court ruled Wikimedia—and multiple other plaintiffs—lacked it. But upon appellate review, the Fourth Circuit Court of Appeals approved standing for Wikimedia in May 2017. However, the appellate court denied standing for other plaintiffs in the lawsuit, which included Human Rights Watch, The Nation Magazine, The Rutherford Institute, Amnesty International USA and more. This victory on a small issue—standing—is an enormous victory in continuing the fight against NSA surveillance. The judicial system can be slow and, at times, frustrating. And while victories in things like discovery and standing may seem only procedural, they are the first footholds into future successes. EFF will continue its challenges against NSA surveillance in the courts, and we are proud to stand by our partners who do the same.